My first contact with the NES actually came much later and, unbeknownst to me, well into the SNES’ lifecycle. I first came into contact with the NES around 1992-1993 when my mother’s family came to visit. I was in pre-school around then. They brought an NES for the older and younger kids to play. The only game they played that night was Super Mario Bros. and Duck Hunt. Needless to say, I was mesmerized by what I saw. I know for sure that I wanted to play what ever they were playing. It was close to bed time, so I knew we didn’t have much time left to play. And since there was only one TV in the house, that time would still be limited by others wanting to watch TV. Eventually that same NES was given to us, along with the games the family had for it. You can probably deduce from the above that the cart inside the NES that night was the SMB/Duck Hunt combo cart. 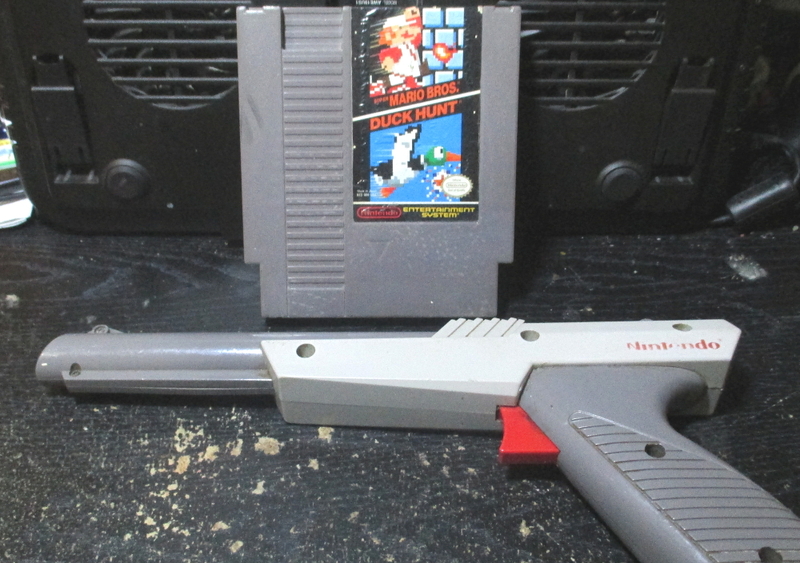 The first I game I played though wasn’t Super Mario Bros, but instead Duck Hunt. Since that was the game that was on, that was the game I played. I’ll go more into detail about both games on a later Retro Weekend. Roughly around that same year of getting the NES, my mother would sometimes get some used NES games for us to play at a game store at The Bronx’s Southern Boulevard, near where she worked. Since money was tight, we would only get a certain amount of games per year, all used. So we pretty much learned how to play the games we had through trial and error. In the first year of ownership, we ended up getting probably 3 or four games for the whole year. The other games we did play was through rentals from Boltron Video and L.A Video in the South Bronx. Off the top of my head, the rented games I can remember were Beetlejuice, Duck Tales, Pipe Dream, Double Dragon II, and Battletoads. There was obviously more than that of course. We did get something of a lucky break when we were able to outright keep a few other games due to the Boltron near our home closing down, as well as L.A. Video purging their lineup of NES games to make room for more modern (at the time) games. Some of those games were Frankenstein, Whomp ‘EM, and Amagon. On the borrowing side, we borrowed games from mostly family and friends of the family. Some of the more memorable games we borrowed were Super Mario Bros. 3 and The Legend of Zelda (there was most likely more, but that’s all I can remember). I would finally own SMB3 on the Wii Virtual Console, with a physical copy of The Legend of Zelda being given to my mother as a Mother’s Day gift a couple of years ago. We did however catch a huge break when a childhood friend of mine was moving to Mexico. He and his mother decided to give us a bunch of games for the NES, SNES, and Genesis. For the NES, the library for that doubled, with about 16 games total (excluding post-2000 purchases). A couple of notables were Ninja Gaiden II, Monster Party, Ghosts n Goblins, Bubble Bobble, and Chip n Dale: Rescue Rangers. We did get one little push again around 2000 which netted us TMNT: The Manhattan Project. After that, almost all further NES games were bought with our own money.